Kim Jae Ryong (Kim Ch’ae-ryong) is Chairman of the Chagang (Jagang) Workers’ Party of Korea [WPK] Provincial Committee and a Member of the WPK Central Committee. 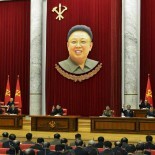 Secretary of the Chagang WPK Provincial Committee in March 2015. He was elected a Member of the WPK Central Committee during the 7th Congress of the WPK in May 2016.